​Does the WAVE fit violas? Yes, it does. While viola chinrests are bigger than violin rests, the players' jaws are the same size and have the same balance and contact requirements. In fact, many violists use violin chinrests. Let us know if the WAVE will be used on a viola, and we will supply the appropriately-sized clamp barrels. Yes, the WAVE, with all of its components, is patent pending internationally. Will the tall sizes fit all full-size cases? The lowest chinrest (1") fits all cases tried; almost all cases fit the medium (1.25") and most fit the tallest (1.5"). Isn't 1.5" awfully tall for a chinrest? ﻿What is the WAVE made of? ﻿Why are they listed WAVE I and WAVE II? WAVE I and II have slightly differing shapes. WAVE I has a more pronounced drop-off from the right to left; this gives a "grippier" feel, but some feel it intrudes too much under the jaw. Also, on some it might rotate the instrument to the right, in front of the player. Wave II has a more gradual drop-off from right to left, giving a smoother, more fluid feel. 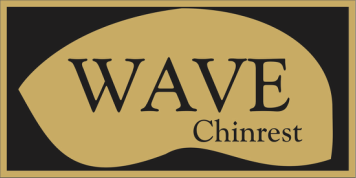 For a deeper look at choosing WAVE I or WAVE, go the the video page here. ﻿How may we schedule a presentation or fitting?